RECCS contests started in 2005, as a result of a string of exceptional successes of Óbuda University students at various spaghetti bridge contests. The roots of the bridge building competitions at our University, however, go back to the end of nineties of the past century. Is it simply the achieved results that drove our competitions ahead? What made and makes our students so successful in this branch of university sports? Is it a skill they acquire during their studies here, is it the traditions, the friendly, helpful spirit and practice-oriented studies of the institute? Most likely all of these together play a role, and this can be summarized in one word: Bánki, which refers to the birth- and raising place of the competitions: Bánki Donát Faculty of Mechanical and Safety Engineering. RECCS as history and as a competition can be very closely attached to the Institute of Mechanical and Safety Sciences at Bánki. The very first bridge building competitions were initialized in 1998. They took place in one of the dorms of the University and the material of the bridge was paper used for technical drawings. These small and closed, friendly competitions created the spiritual core of RECCS by letting the students to experience something we would call today the very essence, spirit or fraternity of mechanical engineering. On the success of these competitions, arose the need to manage our students and let them compete on a broader scale. In meeting this, the Institute first initialized the participation of our students in contests organized by Ybl Miklós College of Building. These contests were organized from the early nineties but only for architectural students. Our students performed extraordinarily well, winning these competitions a number of times. Hearten up on their success, the first home contest was organized in 2003, with the rules identical to those of the Ybl contests. These rules are the ones that provided the base for the ones we apply today on RECCS. The popularity of the contests after this rose sharply, the achieved results were already worldwide best. Taking the next step forward, the Bánki Faculty took over the management of the competition and from on 2004 we entered our best teams for the international competition organized by Okanagan University in Canada. The success was extraordinary. In next seven years six times in a row (the seventh year our bridge was broken under unknown circumstances before the competition) we won the competitions with results far above the others’. Parallel to this, during these years, our competition continued to grow. First we organized competitions for the Carpathian Basin, then for Central Europe. These contests were the first to run under the name RECCS. Based on the achieved world records, the tightening of the competition and the achieved level of its management we decided to attract and involve teams from outside Central Europe, from countries such as Germany, Iran, Italy and Latvia. 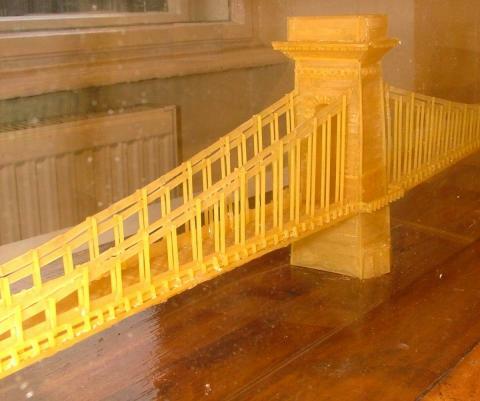 In year 2010 we had a special category: Chain Bridge (Hungary’s well-known architectural sight). The response and success was enormous, we had 12 teams built the model of the bridge. The category was won by the team coming from Islamic Azad University of Qazvin. In 2011 the University entered the management of the contest and the first World Championship was announced. Since then, RECCS was attended by 17 countries worldwide with 143 teams consisting of altogether 278 students. They built 170 spaghetti structures that held more than 28 tons of load. We had professors as observers from prestigious universities and institutes among others from Johns Hopkins University in the USA and the Institution of Engineering and Technology (IET) from UK. The competition jury is made of University Professors; the main patrons are Mayor of Budapest and the President of Hungarian Chamber of Engineers. The event is a challenge in both the organizational and technical sense as it is aired by the public media and we cast the competition live on the internet in HD. RECCS had a key role that the success of Hungarian students and the Spaghetti Bridge Building University Contest entered into public awareness in Hungary and in number of other countries. In 2015 we celebrated first 5 years on RECCS. In 2016, the management and organization of RECCS has been continued by prof. Rajnai, the new dean of Bánki Faculty. From this year on, we encourage the participation of international teams as well. With this, our aim is to emphasize the openness, and international teamwork supporting character of RECCS. Also from this year, the teams were invited to write articles about their home competitions and preparations for RECCS. These writings were published on the webpage of the contest, giving a new dimension to the competition. 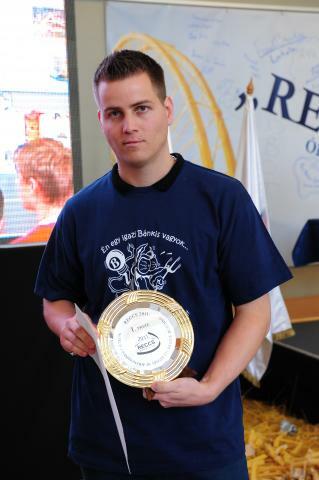 Today, RECCS is one of the most prominent spaghetti bridge contests in the world, and it can be considered as Óbuda University’s contribution to the university life of the World, in terms of student competitions.